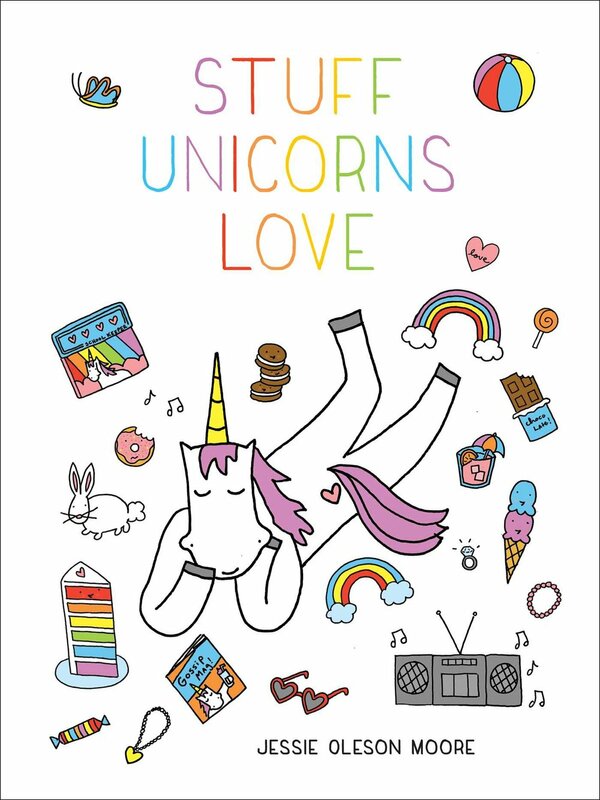 When I think of peanut butter, visions of happiness, butterflies, unicorns prancing, and cotton candy clouds dance in my head. I love the stuff that much. So when I received the book Peanut Butter Comfort: Recipes for Breakfasts, Brownies, Cakes, Cookies, Candies, and Frozen Treats Featuring America's Favorite Spread , I was pretty psyched. Especially since I happened to have plenty of peanut butter around at the moment. Naturally, I was drawn in pretty instantly by this recipe because it had pink thingies in the photos. 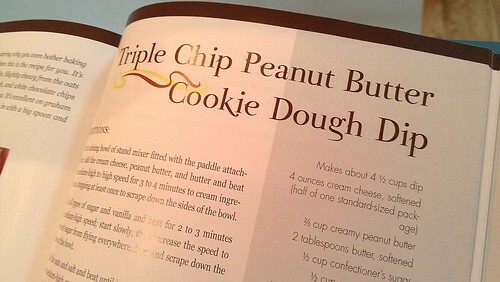 But then, upon futher review, I found that the recipe was for something amazing: Triple Chip Peanut Butter Cookie Dough Dip. Like, OMG. That's a dip I can get into! Even better, the dough is egg free, so that dough can get right in your mouth. 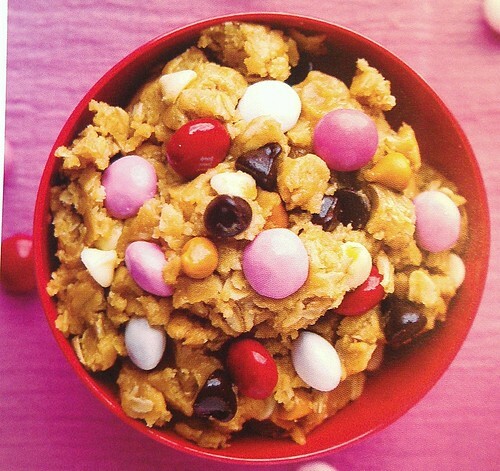 What would one use cookie dough dip for, you ask? Well, that's kind of a dopey question because I really hope you already have some ideas. It would be a great, indulgent frosting, or a nice dip for graham crackers, or...you know, great by the spoonful. Yum. In a stand mixer fitted with the paddle attachment, cream the cream cheese, peanut butter, and butter, mixing on high speed for 3 to 4 minutes until nice and smooth and creamy. Pause to scrape down the sides of the bowl. Add all the sugars and the vanilla, and beat for 2 to 3 minutes on medium high speed. Start slowly, then increase the speed to keep from having a sugar snowstorm. Pause to scrape down the sides of the bowl. Add the oats and salt and beat until incorporated, 1 minute on medium high speed. Stop and scrape down the sides of the bowl. Add the flour, one tablespoon at a time, mixing after each addition. Only add enough to give it your desired dip consistency. Fold in the m&m candies and all those chocolate and other chips by hand or with a couple swipes of the mixer on low speed. Serve right away, or keep chilled. Keep this tastiness in the fridge for up to a week.